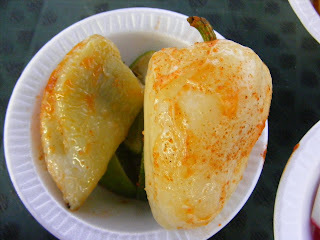 These chiles gueros are quite amazing. 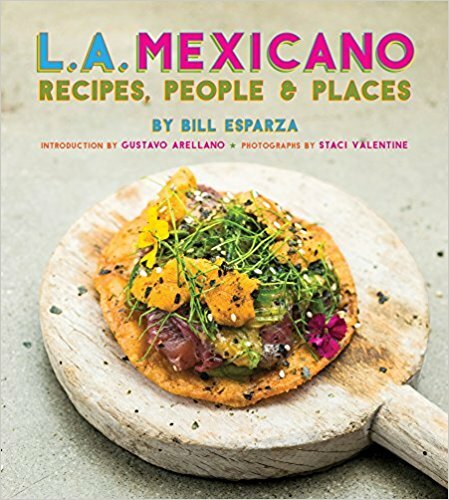 Last Tuesday, there were 14 of us in attendance for the world famous fish tacos, Ensenada style.What there to say that hasn't been said about Tacos Baja Ensenada?As Jonathan Gold said it best,"entire religions have been founded on miracles less profound than the Ensenada fish taco." The stock value of some local restaurants here in LA are entirely driven by people's hunger for this wonderful food. A double fried battered fish wrapped in a warm flour tortilla, dressed with cabbage, pico de gallo, pickled onions, crema mexicana, a squirt of lime, and some salsa or hot sauce to finish.This is the ultimate stret food in Ensenada and throughout Baja California. TBE would not be out of place stashed behind the tourist hoards that clog the first three streets parralel to the malecon in Ensenada.Once you get to fifth street in Ensenada you are in Mexico, where the best fish taco stands are frequented by the locals.With the famous Tacos El Fenix and La Floresta. No barkers or bad versions of the Mexican Hat Dance to blow your fish taco high. But thanks to TBE these sublime creations are right around the corner in here in East LA. Some class members were surprized by this choice of cuisine. Fish tacos?Is that all?But, it was soon love at first bite. The fish tacos at TBE are crisp and crunchy on the outside with a delicious seasoned batter that accented the yummy pollock inside.The shrimp tacos, interminably second fiddle to the fish tacos, were excellent offerings as well.The only thing I missed at TBE is the ritual of assembling the fish taco myself as you do at the fish taco stands in Ensenada, and all the choices of salsas. But, they have some wonderful chiles gueros. These chiles pack a medium heat but are the most flavorful of all the fresh chiles in my presumption. 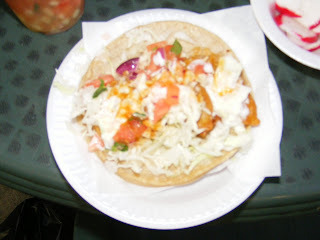 I also enjoyed the campechana, a perennial favorite at seafood joints all over mexico. This is the mother of all "cocteles". This night wouldn't have been complete without Herman's generous donation of beers to further the cause.I surreptitiously poured rounds for Dennis, Herman, and myself on the advice of the owner of TBE, who doesn't have a liqour license. 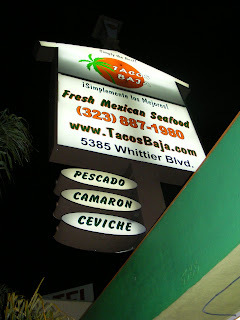 Tacos Baja Ensenada is one of the best Mexican food experiences to be had in Los Angeles. Its authenticity tranports you to one of those little stands in Baja California where time stands still and it's just you, the fish taco, a cold cerveza, and the warm embrace of a Mexican sunset.